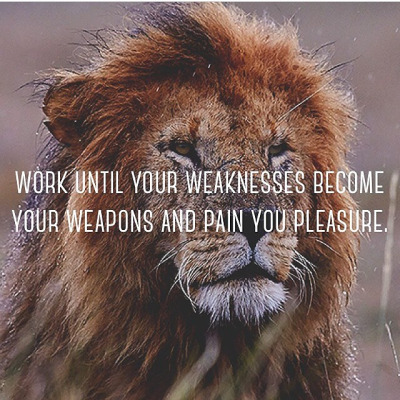 I feel like I’ve been getting signs everyday aka being chirped about working on my weaknesses. My weakness is definitely working on my weakness. I find it to be such a discouraging process because I’m always dying to get things right the first time. When I really started to notice how off balance my upper body was in comparison to my lower body, in terms of strength, I wasn’t too worried. I thought maybe if I worked at certain exercises for a couple of weeks it will get there. Nope, it has been an extremely slow process thus far. People generally assume that because my arms are toned it means they are strong…naw. Don’t worry clearly I’ve been faked out by that assumption too seeing as I just figured out how bad this weakness is. 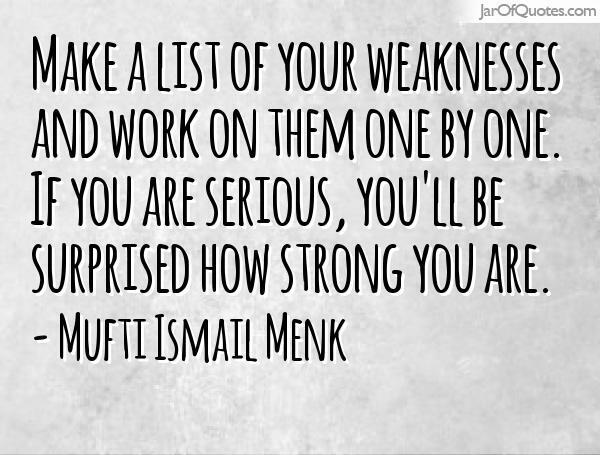 My goal is to get excited about working on my hit list of weaknesses. Last week, I thought I was making progress by just showing up and doing the workout…no matter what it was (rebel). I started this week with fear so I went back to old habits of justifying my anxiety towards a workout. Time to change that …again. So here is my list of weaknesses that I think should be manageable for the meantime and also very rewarding if they get better! Trying the RP Auto Diet Template to see if this can get me on the right path. Here is a link Renaissance Periodization Diet. 2) Running… – I have tree trunks for legs so running is never fun. But Imagine a world where it could be fun. *clap*Do *clap* Not *clap* Skip*clap*Running *clap* Wods!!! 3) Anything overhead (Pressing or Pulls)! – I get so embarrassed about doing exercises like this (I hope I hide it well). My way of actively working on this is participating in WODs that have this. I’m not sure if this would be considered a passive way of working on this weakness. In the next phase of the lifting program, I’m hoping to incorporate more of these as accessory work.